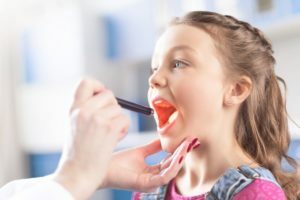 Tonsil infections are a common childhood malady, bringing pain and discomfort to many children between the ages of five and 15. The result of inflamed tonsils, the condition – known as tonsillitis – is most often caused by a viral or bacterial infection. Instead, home remedies are usually recommended for tonsil infections caused by a virus. Your child should get plenty of rest and stay hydrated with fluids. Warm broth or tea, and cold Popsicles, are particularly effective at soothing pain and discomfort. Pain and fever can be controlled with over-the-counter medications like ibuprofen and acetaminophen (but avoid aspirin, which can be harmful in children). Throat lozenges or cough drops can be given to children over the age of four.